Azoralla Arroyo Caballero and Michael Hanna. Photo by Rich Ryan. Mixed Blood Theatre has just opened Mermaid Hour: Remixed by David Valdes Greenwood with music by Eric Mayson, as part of the National New Play Network Rolling World Premiere. The non-musical version is playing at other theaters around the country, as Minneapolis premieres its musical reworking. While it has its moments – sometimes powerful, sensitive, beautiful, thoughtful – it has one basic issue: if it’s going to call itself a musical, the lyrics need to carry the story, but that is not the case. (In fact, no lyricist was listed in the program.) There is a story of substance here, and it’s heartfelt, but why are they singing? The play is about parents who want to do the right thing to support their 11-year-old transgender child, if they only know what “the right thing” was. This is a loving household, with open, honest – and hip – parents. And they are struggling. (We can’t help but imagine what a trans child must face in a less supportive home!) The premise, the characters and the dialog all work towards a moving and satisfying ending, although I wasn’t sure whose story it was until the second act. 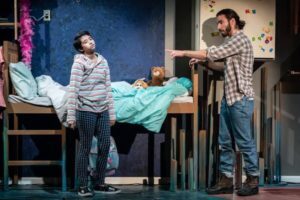 Thallis Santesteban plays “Pilar,” Vi’s Latina mother, who feels burdened by “having to do everything for this family,” but we understand that it’s the larger question of their only child’s future that weighs her down. Santesteban’s performance capitalizes on her character’s intensity and fierce loyalty to her daughter. Azoralla Arroyo Caballero plays their child named Victor, later “Vi” as her gender identity becomes clear to her at a very young age. Caballero is irresistible, as is her best friend, Jacob, played by Meng Xiong. I longed for just one more scene between these two charmers. But the absolute high point of the show, dramatically, is Vi’s father (“Bird”)in a scene-long retelling of a pivotal moment with a very young then-Victor. It was a brilliantly believable performance by Michael Hanna as the father, tortured by his own perceived shortcomings and his daughter’s innocent understanding of herself. Therein lies a problem: this is a musical and the high point had no music. Still, one could argue that musical theater conventions get broken all the time these days, so why does this matter? Because, in the world of this play, this convention wasn’t set up. In fact, the lyrical hooks in the songs had littered little red herrings all along the way. Song titles weren’t listed in the program, but I think these will suffice: “Just Another Family Night in America” at the top of the show might have plunged us into the emotional action of the play – or at least hinted more strongly. It didn’t. “All Things in Moderation” wasn’t about moderation, I didn’t think, and “Little Miss Progressive/Color Me Conservative” might have gotten the job done more believably as a very short dialog scene. “Do They All Say It’s Safe?” has Pilar agonizing over the decision she faces as their daughter fast approaches puberty. This phrase is repeated a lot, as is typical in pop songs, but that much repetition doesn’t play as well in theater. “Glow, My Children Glow,” beautifully performed by Catherine Charles Hammond as the Merperson, uses metaphorical, even poetic language. This provides a consistent divide between this otherwise realistic play and Vi’s “dream” of the person she longs to be. In general, the songs tend to not emerge at The Moment where the purpose of the scene is clinched, where a character breaks into song because he or she must. The songs, rather, feel related to the action, but are not the action. I liked composer Mayson‘s music, a somewhat sophisticated soft-pop style, that fit the time and place, and provided a delicate balance among the characters. Sometimes he sang, too, from the keyboard, which really pumped up the vocals. Greenwood clearly wanted to write a play that incorporated characters from various ethnicities, which is a worthy idea, but the cultural questions do not seem to be rooted in ethnicity, so it feels a little “attached” to the real conflict, which could be any parent’s in the situation as it’s represented. In any case, it’s a story that should be told, and as a play I think it would work. I’ll recommend it for its fresh take on an important question. You’ll find it worthwhile – and enjoyable. The key point is that this conflict can be any parent’s, regardless of ethnicity. I just wondered about it. Regardless of how this reviewer felt about the production, the above statement is a perfect example of micro-aggressions in theatre towards people of color. Were the characters not ethic enough for this reviewer’s taste? Would she have felt better if the families were all white? If so, do these stories belong only to the white family narrative? Did she need to see stereotypical behaviors on stage in order to make it ok to have multicultural diversity on the stage? I am curious what it would have taken for her to feel the different ethnicities in the story were properly “attached” to the conflict.